Vagally mediated bronchoconstriction in control and antigen-challenged animals. 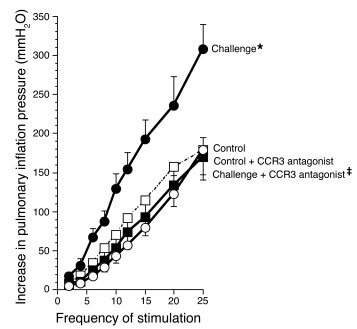 Antigen challenge induced potentiation of vagally induced bronchoconstriction is inhibited by the CCR3 antagonist. In control animals (open circles), stimulation of both vagi (10 V, 0.2-millisecond pulse duration, 5-second pulse train) caused frequency-dependent bronchoconstriction that was significantly increased in antigen-challenged animals (filled circles). Pretreatment with the CCR3 antagonist (filled squares) prevented the increase in vagally induced bronchoconstriction in antigen-challenged guinea pigs. n = 5–7. *Significantly different from control, P = 0.001; ‡significantly different from challenged, P = 0.0006. The CCR3 antagonist did not affect vagally induced bronchoconstriction in non–antigen-challenged control animals (open squares; n = 6).